My girlfriend learned from her aunt how to make & preserve blackberry jam a couple of months ago. It’s very tasty, but that wasn’t the part that had her excited. She first thought about making jams & jellies to give away on Christmas. It’s fairly inexpensive – $10 for 3-5 half pint jars of concentrated berry goodness, people love it, can be decorated to look snazzier than just a glass jar & metal lid, so what better to give friends & family? Come to think of it, people pay good money for this stuff. There’s a big push against mass produced foods. Farmers markets are busy places these days as people fight for the organic, local, cage free, home grown, and home made alternatives to the big evil grocery store brands. People would pay $6 or more for a jar of concentrated berries, especially if you make it look nice with a ribbon or other farmhouse bling. So why not sell it? $3 of ingredients, sell for $6, and pocket the extra! And why stop at berries! Apple butter is very tasty & apples are pretty inexpensive per pound. Off-brand peanuts cost $2.50 per pound, taste just as good, and a couple passes through a meat grinder reduces them to a slightly crunchy, wholly delicious peanut butter. Use honey roasted peanuts and the next time you have to buy peanut butter will be to load mousetraps. The girlfriend’s other idea, which I admit I wasn’t too keen on at first, was candles. Large amounts of wax melted on the stove sounds like a good way to burn down the house, especially when you remember overheated wax vapors are explosive. But, with a double boiler, it’s safe enough. Some parafin or soy wax, a dash of scent oil, a couple blocks of coloring, and some Goodwill store wine glasses add up to quirky, unique candles perfect for, well, someone quirky & unique. So, all these things can be produced for less than $4 each, sold for $6-8, have fun making them, and have enough money to go to the movies every once in a while. Good plan, right? I talked to an accountant friend. Time to break out the calculator. The missing ingredient of all of these is time. Two pints of blueberries, a lemon, two cups of sugar & 3 jars may cost $10, but it takes an hour to do so. If we pay ourselves $10/hr, that jam went from $3.33 a jar to $6.66. Assume you spend a bit on labels & decorations, and you’re at $7 to produce half a pint of blueberry goodness. If a stranger walked into our kitchen & offered us $6 for half a pint of blueberry jam, we would be right to turn them down. And call the cops. Of course, I’m not including the energy bill for running the stove, and assuming one hour is enough time to cook & clean up after ourselves, and shop for the ingredients, and a handful more tasks. But, here’s where it gets really bad: sales. Our local farmers market has pretty reasonable dues, maybe $10/day when you buy for the whole season. And, for the sake of argument, let’s say we’ve got some folding tables & a canopy, and all the table decor to make our little booth look nice. And maybe we use 2 jars of samples & some crackers, at a cost of $15. We’re at $25 for the day. At $7 to produce & $8 sales price, we need to sell 25 jars to break even, right? The market runs 8am-1pm, 5 hours, so one sale every 12 minutes. That’s a reasonable day. Oh, but we forgot to pay ourselves again! 5 hours, plus an additional hour to setup, tear down, and drive, means another $60. Now we have to sell 85 jars to break even. That’s a pretty lively business. Raise the price to $9, and we’re down to only selling 43, but how many people would spend $9 for half a pint of jam? Could we even produce 45 jars of jam per week (43 to sell, two samples)? At an hour per three jars, that’s 15 hours. In addition to a full time job, 3 hours per day, 5 days a week, plus 6 hours to run the market on Saturday. 21 hours per week. I know, we could probably make larger quantities & speed things up, reducing production times & increasing revenue per jar, but we’re talking about making 5 products or more, so we can’t streamline things too much or we wouldn’t have the variety. Phew. let me step back a bit. OK, I’m feeling better now. If I went on, I’d have to talk about insurance and marketing and capital expenses, but I won’t. I’ll pull out a jar of blueberry jam & some hot biscuits, admire the chunks of fruit as the juice melts into the pastry, and take a big bite. The tart flavor will remind me that I bought the berries at a farmer’s market, and I’ll be appreciative of all the work someone else is doing so that I can have fresh, local foods. And probably get a blueberry stain on my shirt. So far, here are my notes on building a Reprap Morgan using easily sourced parts in Iowa. Easily sourced means the metric bits need to be kept to a minimum. The rest was printed on a Reprap Prusa Mendel with a SeeMeCNC Steve’s Extruder and their Bowden hot end, using green ABS from Makergeek, sliced with Slic3r 0.9.10b with two shells & 20% fill. That feels a little flimsy on the thinner pieces – if I break something, I’ll probably re-print at 5 shells. I printed the moving bits for the shaft – the two drive wheels & 4 arm pieces, plus the Bowden lock nut. I was surprised how well the nut fit – I thought my printer wasn’t accurate enough, turns out the spring belt tensioners I added work wonders. I printed the metric version & substituted hardware for what was close, and had fairly good luck. For the main shaft I used a 5/16″ x 3′ threaded rod ($2.50 or so) a box of 100 hex nuts & a box of 100 washers ($10). the instructions call for a pipe crimped around two nuts to improve stability – I got a 1/2″ x 2′ copper pipe ($5). For the outer tube, I got a 3/4″ x 2′ ($7) that barely fit the printed parts. OK, it probably was too tight, but I’m pretty sure it isn’t going to slide around. for the “elbows” I got a 4″ and a 2.5″ x 5/16″ bolt, a little over a dollar for the two. I did buy metric bearings. I didn’t know where to look for the 6805 (the one I got is labeled as an auto part if that helps), so I bought through Amazon ($7) and the 9 608 bearings are used in roller skates & skateboards. It was cheaper to buy a 10-pack off Amazon for $10, though. As for assembly, the washers were too big for the bearings & caused them to grind, so they were skipped. 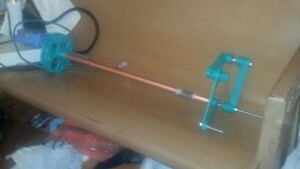 Since this is just a test fit, I didn’t crimp the 1/2″ copper tube yet, either. But, with some gentle persuasion, everything fits!The copper tube may need to be seated deeper into the printed parts than I have it, but not bad for a test fit & guesses at the hardware store! Total investment so far is about $43. I’m not a big fan of the stand design, so an enclosed one may be in my future. Maybe built as a freestanding table. I’ll still need electronics (~$120), 4 steppers ($70), a J-head hot end ($50+), linear rod & bearings (? ), heated build plate, fan… this is far from a cheap design. There’s a certain amount of pride that comes from doing something yourself, whether it’s painting a fence, fixing the car, or creating a precision computer-driven laser cutter. You heard me – weekend projects have evolved from lopsided birdhouses to complex robotics, custom electronics, and tools that make the professionals jealous. At the heart of this revolution is a funny little gadget called an Arduino. It’s a miniature computer, able to be programmed to do the tinkerer’s bidding. Simply plug in a USB cable & tell it what you want it to do. Blink some lights? Simple. Run a few motors? Easy. Automatically post to Twitter when your plant needs to be watered? Not a problem. Now your DIY Garage Warrior is armed with computerized control of whatever he or she wants. Build a proximity sensor that automatically opens the garage, or a robot that brings you beer from the fridge. But where are you going to get the custom-made pieces for your new army of robotic minions? Once only available to the big boys, custom manufacturing has moved to homes. In CNC milling, a robot moves a router bit though a computer-programmed path, cutting the desired shape as it goes. For $400, a DIY enthusiast can build one of these gadgets, using a Dremel to carve the custom pieces they need. Or, replace the Dremel with a laser module & you can quickly carve through craft foam & other materials. Or, take the same robot & use a molten plastic extruder instead – now you have a 3d printer & can build custom plastic pieces without the noise & wasted material of milling. Now you’ve got the tools to build nearly anything! What’s next? As it turns out, what’s next is really exciting. Make the technology better, faster, more precise, less expensive, and more available. Some day every home may have a 3d printer, able to print out anything you need at the push of a button. Just keep the raw materials on hand & push print when you want a birdhouse, toaster, or MP3 player. But then, without the workshop in the garage, won’t the DIY movement come to an end? I don’t think so – the focus will just shift from building something familiar to creating something new. The design will be the next frontier, and that’s where the tinkerers of this world will really shine.